ALL INDIVIDUALS HANDLING THIS INFORMATION ARE REQUIRED TO PROTECT IT FROM UNAUTHORIZED DISCLOSURE IN THE INTEREST OF THE NATIONAL SECURITY OF THE UNITED STATES. HANDLING, STORAGE, REPRODUCTION AND DISPOSITION OF THE ATTACHED DOCUMENT WILL BE IN ACCORDANCE WITH APPLICABLE EXECUTIVE ORDER(S), STATUTE(S) AND AGENCY IMPLEMENTING REGULATIONS. I am a Secret Squirrel. I have, or rather had, a top secret clearance as it most certainly expired years ago. 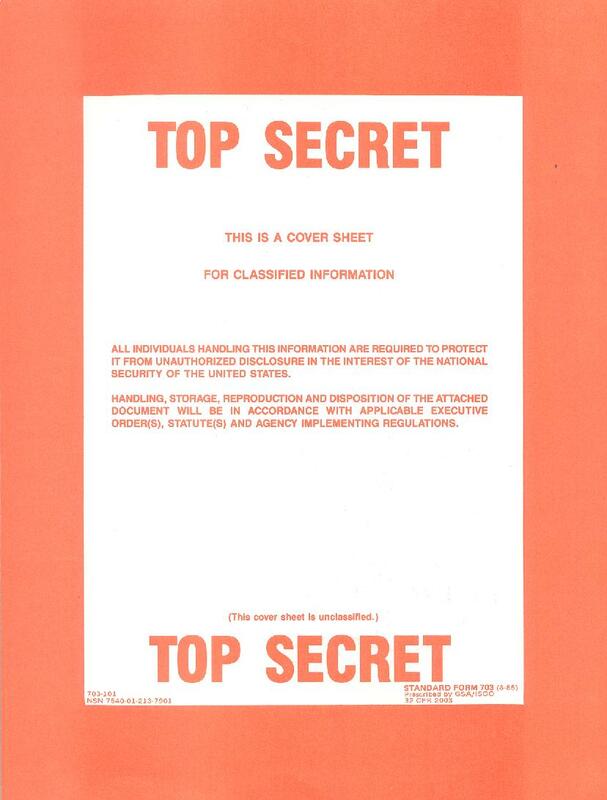 My clearance was known as a TS/BI/SCI or Top Secret-Background Investigation-Sensitive Compartmented Information. Having an expired clearance doesn't mean, though, that I am free to tell the secrets entrusted to me. The statute of limitations on classified never runs out even though what I know is long since obsolete. Getting my TS clearance involved lengthy interviews and an exhaustive questionnaire administered by a very nice, but doggedly determined lady from the Justice Department. I don't remember her name, but it was probably something like Minerva, or Millicent. Have I ever travelled to a communist country? Do I know anyone who has? Do I have any relatives who have ever advocated the violent overthrow of the US government? Do I have any large debts? Is there anything in my past which may be used to coerce me? And on and on. The last question, asked as the interview was ending, was probably the one that tripped up the most people: Could you give us the names of two or three people who know you well that we might contact? Of course you'd give the names of friends who would only say glowingly positive things about your character and trustworthiness. She would then contact those people and ask them if there were two or three other people who might know you. As the circle expanded, a real picture of character would emerge. Quite effective, I imagine. Well she must've been off her game and not gotten around to certain ex-girlfriends or people I had otherwise slighted, and I was issued my top secret clearance. It was a good thing as well because not having a security clearance for a job that needed one meant you would soon be looking for a new job. My job at the time was as a pilot flying the KC-135 Stratotanker for the Air Force's Strategic Air Command or SAC. SAC no longer exists, but its primary mission was nuclear war. Ironically, the SAC motto was "Peace is Our Profession" to which we would always add "War is Just a Hobby". We were the guys (and gals) who were going to go to nuclear war "toe to toe with the Russkies" as Slim Pickens so eloquently put it in Dr. Strangelove. One thing you quickly realized when offered entrance into the world of secrets is that this was a place untouched by any sense of levity or humor. Getting access to classified documents involved briefings, warnings and the signing of multiple statements continuously reminding of you of your responsibilities when handling classified material including the penalties that awaited should you screw it up. The classified study area itself was in an actual room sized vault. Nothing went in or out. We had no cell phones back then but all the handsets had push to talk mic buttons so conversations couldn't be overheard. Any documents left on a table top had to have a cover sheet to prevent unauthorized viewing. And the stuff was boring. Oh my god was that stuff ever boring. Most of it involved details concerning codes and communications. There were flowcharts, and rules, and exceptions to those rules and exceptions to the exceptions. It was stuff we might need to get encrypted messages and what those messages meant. No "deep state" kind of stuff at all. Very disappointing. And our "comm" class was right after lunch. Staying awake took Herculean efforts. I came to the conclusion that this was secretly some type of Chinese torture resistance training in case we were captured. But that changed one day. Most of the material we had been dealing with to that point had been classified "secret". The government has three levels of classification which determine the security measures and procedures used to protect that material. They are "confidential", "secret" and "top secret". Each level has its own increasingly complicated protocols and increasingly severe penalties for breach. Somewhere it had been determined that we now had the need to be given access to some "top secret" information. Aha! At last I was to be given clearance into the inner sanctum. Now I was to find out if Herbert Hoover really did cross dress, who had really killed Kennedy and maybe even where Jimmy Hoffa was buried. On the appointed day we were led into the vault and from an armored combination locked filing cabinet came a thick metal bound and locked notebook. All Maxwell Smart-y. Sadly, Agent 99 was nowhere in sight but it was thrilling nonetheless. Only after signing more documents giving up claim on our souls and firstborns was the notebook opened. Then came the Geico moment. You know the ad where someone says "did you know that...." and the other person answers "Sure, everybody knows that". Well I looked at this stuff and immediately thought, is that it? Everyone knows that! Where's the REAL secret stuff?!? Alas, there were to be no great revelations about the inner workings of the US government, the Air Force or even the Strategic Air Command for that matter. What I saw in the vault that day was public, obvious, and common knowledge. Sure it was stuff we "needed" to know but it was just common knowledge to anyone who had sat down and thought about it for a moment. My guess is that it was actually the imprimatur of the US government on the information that made it top secret. Essentially an official confirmation of widely held but otherwise unconfirmable knowledge. Still, if I told you what great secret it was that was revealed that day, I could still go to jail for a long time. Trust me, you wouldn't be impressed. Or as one smart-alec intel briefer would always end his classified briefings..."for further details, please consult the USA Today". So what do you think? Does our government keep too many secrets? I'll toss in a secrets story... First trip in the C-5, new guy gets to carry the "secrets" which back then was a manila envelope with authentication codes, no big deal. These days the "Secrets bag" is a full size backpack with sat phone and multiple GPSs. When it was a manila envelope it was easy to fold in half and stick it in the bottom pocket of your flightsuit. On my first RON (remain over night) at Osan airbase Korea that envelope stayed in my flightsuit pocket. I discovered this in my Q room. Thinking "Oh No! I'm gonna get in trouble for this!" I decided to stick it under my mattress for the night. Lifting up my mattress I discovered another manila envelope from a previous room occupant! Both envelopes remained secure for the night under my mattress and both envelopes made it to "secure destruction." I'm sure there are dozens of similar stories out there. We used to fly a classified mission refueling a recon airplane but the flight plan was always the same...same route. It seemed curious because the other guys already knew where we were going to go until you realized that it was the US media that wasn't supposed to know where we were going. Take care.